The holiday season is so short, sometimes it seems to fly by faster than Santa’s sleigh. Since this time of year is traditionally spent with friends and loved ones, why miss a minute of the sounds you love most? When you take full advantage of your hearing aid capabilities, you can enjoy the festivities to their fullest. aids enhance your holiday spirit! Hearing aid features: Between the holiday music, laughter and clatter of dishes, participating in the conversation can be challenging. Can your hearing aids minimize background noise so you can focus on what the person in front of you is saying? If so, learn how to adjust the settings to maximize this feature — and be sure you know how to maximize other holiday listening environments, too. The proper accessories: Whether you’re an avid skier or just a seasonal sledder, you’ll want to have the right gear to protect your hearing aids from wind and moisture. Other accessories, such as Bluetooth streaming devices and assistive listening devices, can maximize your benefits. If your hearing center doesn’t sell what you need, ask the staff if they know where you can find it. 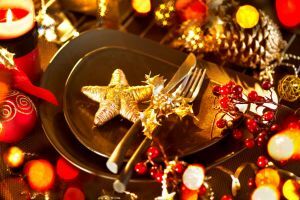 You can also prepare for holiday fun by wearing your hearing aids daily around the house. Since hearing is a brain function, the more often you wear your hearing devices, the more practice your brain has translating the signals it’s receiving from the hair cells in the inner ear. This is especially important if you’ve just begun wearing hearing devices after a long period of untreated hearing loss, as there may be some sounds your brain has forgotten how to translate. Stock up on batteries. Make sure you have an ample supply of fresh batteries within reach so you don’t have to make an emergency run to the drugstore. Child-proof your home. Especially if little ones will be visiting, designate a safe place to store your hearing aids and their accessories, including batteries. Little minds are inquisitive! If your hearing loss prevents you from hearing well when you’re in a noisy situation, be prepared when you attend the office party or a friend’s holiday party. Control your environment. Let your hostess know you have hearing loss and ask to be seated the furthest away from the television or kitchen so you can minimize background noise. Take advantage of off-peak hours. If your plans call for dining at a restaurant or two this month, consider eating earlier to avoid peak dining hours between 6 and 8 p.m. Or plan to dine on a weeknight, when restaurants are much less busy. Use the buddy system. Attend festivities with someone you trust who knows about your hearing loss. They can help you navigate noisy situations and boisterous conversations. Whether the production is Broadway quality or performed by your favorite little Scrooge, be prepared to hear your best. Look for looping. Check the venue’s website to see if they have a looped system or other assistive listening device options. If they do, note how to request the service and arrive in plenty of time to acquire one as some facilities have a limited supply. Reserve seating. If the production is being presented in a local gymnasium or another facility without assistive listening services, call well in advance to ask if you can reserve seating near the front of the audience. Bring batteries. Carry a fresh set of batteries with you just in case. Much like carrying an umbrella while the sun is shining, it never hurts to be prepared. Take a moment to evaluate. Did your hearing devices meet your expectations? If not, make a list of what needs adjusting so you can discuss it at your next regularly scheduled appointment. Ask your hearing healthcare professional to make a note of these adjustments in your file so you’ll be even more prepared to greet the next holiday season. If you’re not hearing as well as you used to, make an appointment with a hearing healthcare professional to find out why. Let healthy hearing be the gift you give yourself this holiday season!